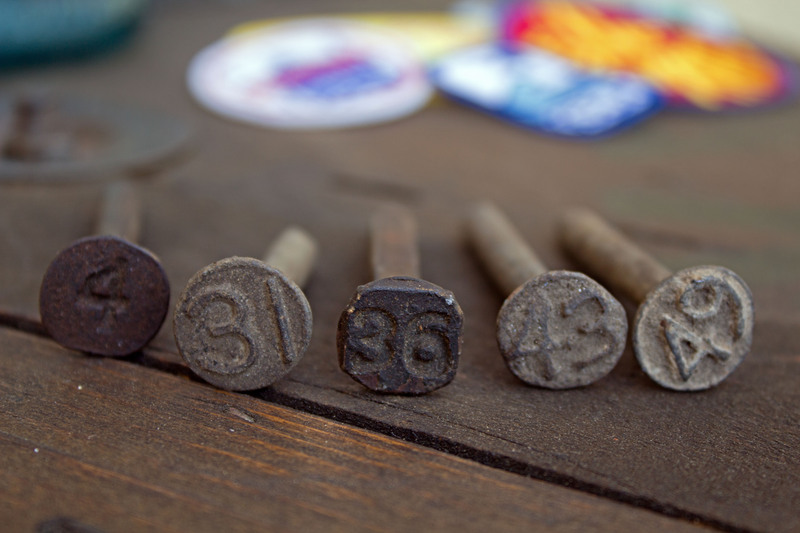 One of my favorite things to look for while flea-ing are fun, vintage pins, which you may have noticed appearances of in other posts. I think it all started with pin trading at Disney and just ballooned. I usually choose pins that represent places we have been or bring back some sort of memories. 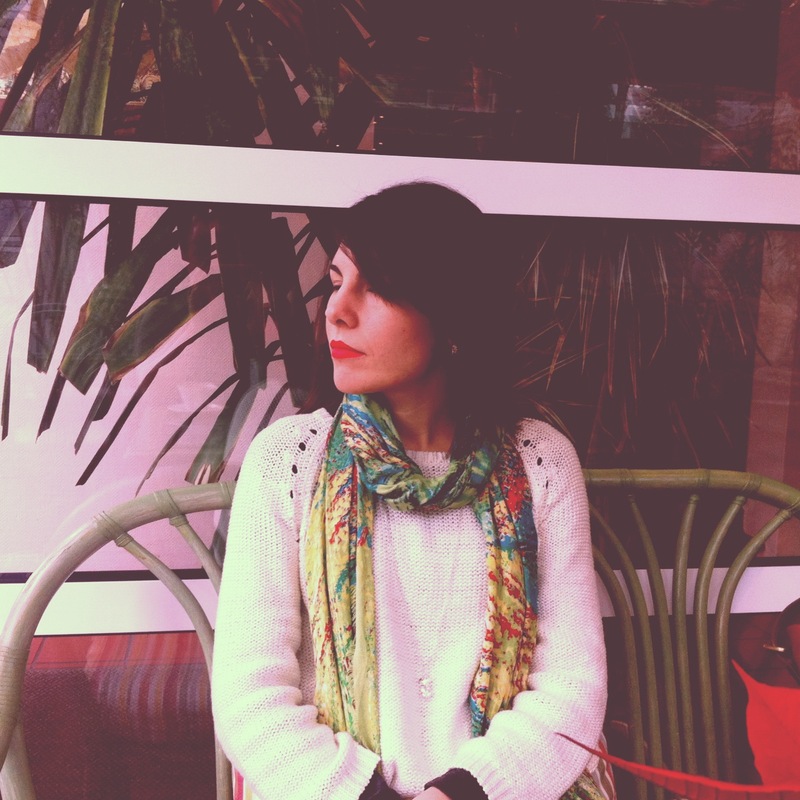 I like stories and I love finding things that have a story, especially if they represent my story. Arizona reminds me of visiting the Grand Canyon with friends in 2015, it was so cold and we only had a few hours to spend there, but totally worth braving. The Six Flags pin brings back so many fond childhood memories of all the time spent at Six Flags over Texas with my parents and siblings while growing up. The New Mexico pin reminds me of all the time spent in the state with our wonderful friends, whether it was stopping on the way through to and from California at Christmas, or the three Balloon Fiestas we have now attended together. The Texas with the state flower is definitely near to my heart AND my roots. The Sandia Peak pin reminds me of going to the peak with our friends when I was halfway through my pregnancy with Addison and just enjoying the large portion of the day there, taking in the magnificent views. I have to mention the glass slipper pin, because as I said, I love stories. 😉 I first spotted it last fall while perusing one of our favorite antique stores in town. I honestly almost walked right past it, but I am glad I looked a little closer. It is a vintage Disney pin that I immediately fell in love with. I did not, however, love the price. I decided to wait it out, even though I was so afraid each time I visited that it would be gone. I watched it for almost a year, until the vendor of the booth priced all their jewelry 50% and I grabbed that thing up quick! I am so excited and can’t wait to wear it on our upcoming trip to Disney. Do you have any fun collections that you love adding to? When Jason and I moved to Colorado, one of the first things we started searching for were flea markets and antique stores. We checked out a couple of flea markets and stores and just really did not love any that we found. One Sunday, while enjoying an early lunch, we did a little searching around on the inter-webs and found Sweet William. I am so glad we did! It is one of our two favorites to frequent in town. It is also one that we love taking friends and family to when they come into town and want to search for treasures. This particular trip, we picked up some Little Golden Books for Addy, a little chalkboard for her room, a Fisher-Price Chatter Phone, and a book of Hans Christian Andersen’s Fairy Tales. I really love well-loved things and I want to teach Addison that there is value in things that may not be new, but are still full of life! 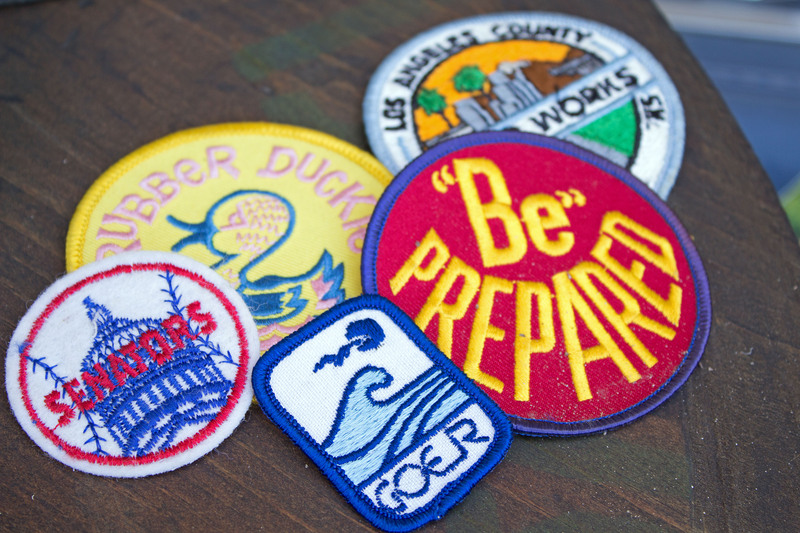 Jason and I have been looking forward to the Rose Bowl Flea Market since moving to California. We were finally able to experience this mammoth flea market last month and found lots of fun treasures! We scored two fun books, a book of tales on California’s Missions and a book to help identify cacti (my newest obsession). I found a bright, German Lebkuchen tin to add to my collection of tins and several patches to be added to a denim jacket. We scored an old metal gas can that has been repurposed and is currently being used as a kitchen table vase. (So perfectly funky!) 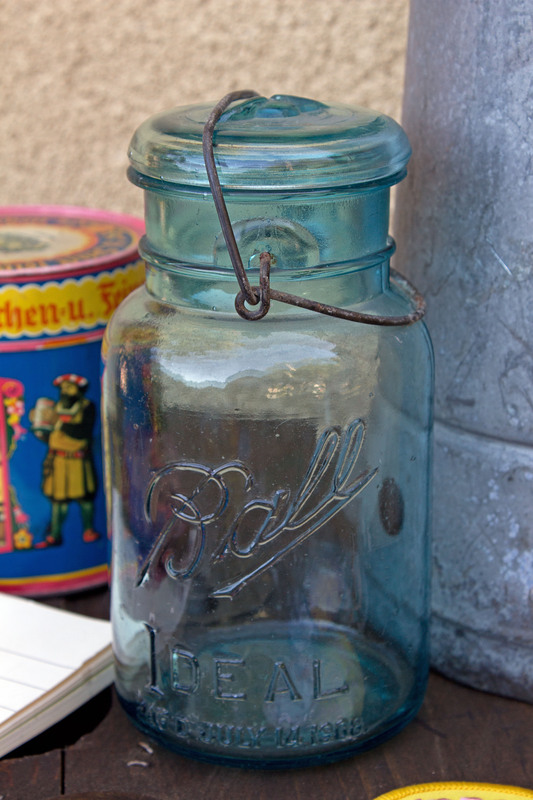 We saw and loved this blue Ball jar and got it at a steal! We both thought the blue glass was so interesting. This weekend, we scored a metal Radio Flyer wagon for a little project to be completed sometime in the next year. 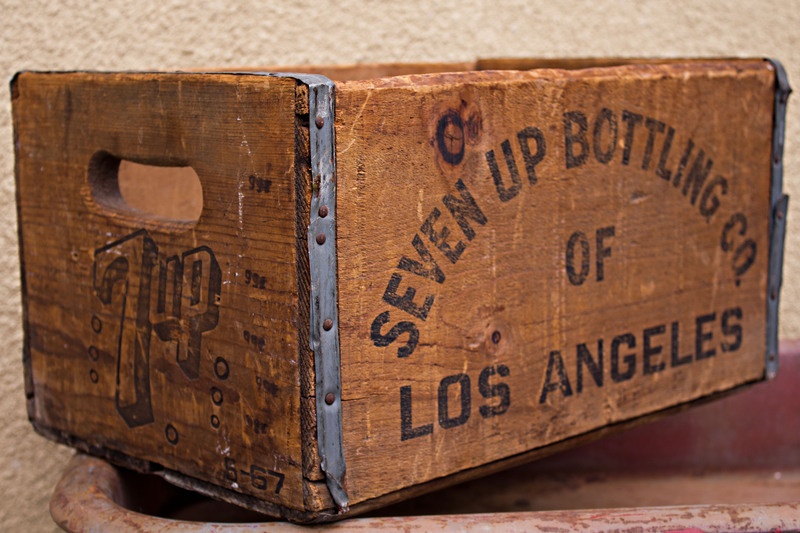 We finally found a wooden bottle container from 7 Up Bottling Company of Los Angeles. We have been on the hunt for one since we moved here, but every time we found one, it was way more than what we wanted to pay. This one was a steal! And, the guy who sold it to us was hilarious. 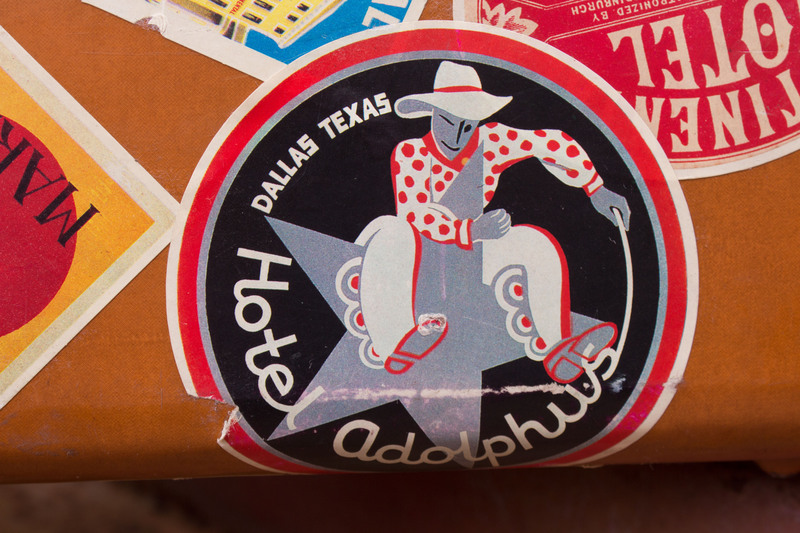 I think my favorite treasure we found this weekend is this funky, vintage Samsonite suitcase covered with these travel stickers. I have always been intrigued by these things and they remind me of the ones carried in old films. 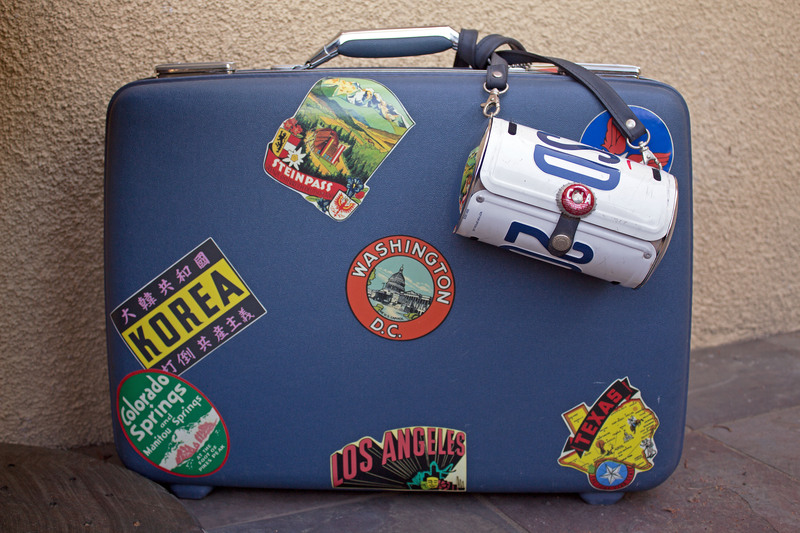 This thing just fuels my wanderlust! 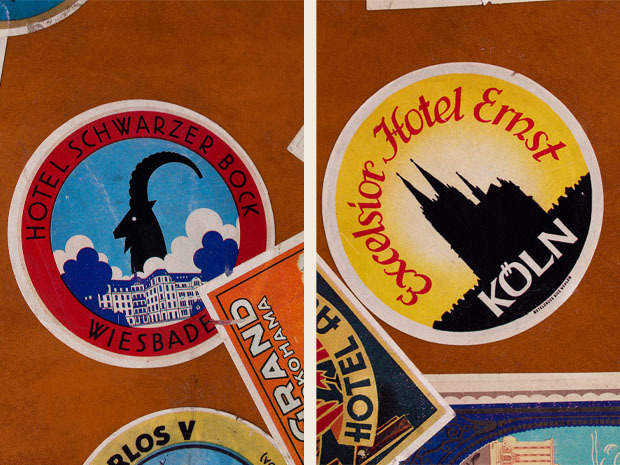 To make it even better, there are stickers on the suitcase from lots of places I’ve actually been, so it’s fun to just look at this thing and recall so many of the memories that were made over the last few years.